The "Take It!" Each year spring arrives and puts my yard into bloom. Once again - I realize that it was the back yard that was the real reason for buying the house. The intensity of the colors and the length of time that the flowers last, lets me know all over again - that the comfort provided indoors is necessity - the splendor of spring while my garden is modest - it is luxury. For those who are considering doing some gardening - I can encourage you, for the planting of the right flowers and bushes will bring annual reward. Thanks for spending a moment with me in this modest but colorful setting. Spring is my favorite season. Such beauty all around! Those are beautiful, what are they? This makes me jealous. I would love to have something like this at my house but I am allergic to bees. Great lookin' backyard. Looks well kept. How beautiful!!!! I am with treehugger, spring is awesome. Perfect weather out our way! Thanks for the kind comments. The yard is amazingly easy to maintain as only have a small patch of grass that is more of an accent than a main feature. Teri: The colorful bushes in the foreground are azaleas and the white flowers are on a dogwood tree that just happens to fall right into line for photographs. I will have to let my husband know to look for those at the nursery. 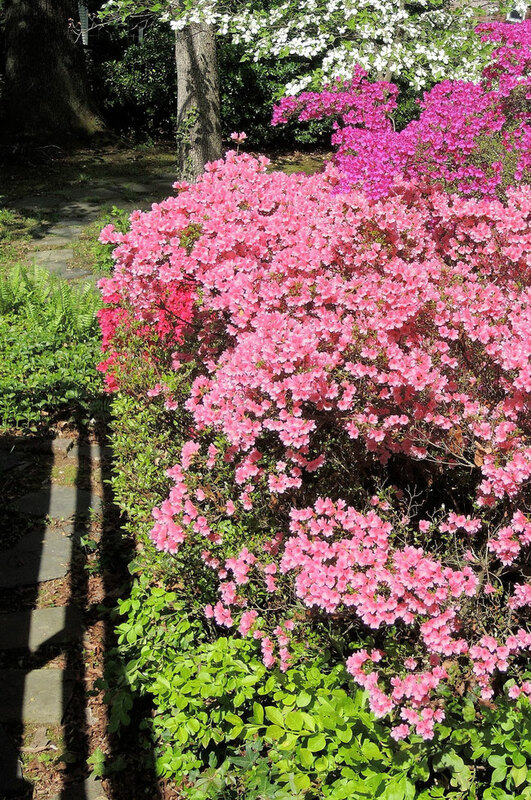 The azaleas are just beautiful.